Upsets the previous day as play in the Men’s Singles event at the Seamaster 2018 ITTF World Tour Platinum Australia Open in Geelong commenced, as matters concluded on the early afternoon of Friday 27th July, more followed, India very much to the fore. Both Sathiyan Gnanasekaran and Sharath Kamal Achanta emerged successful against seeded players as did Chinese Taipei’s Lin Yun-Ju and Japan’s Yuki Hirano. Sathiyan Gnanasekaran beat Japan’s Masaki Yoshida, the no.15 seed (11-8, 7-11, 11-9, 7-11, 5-11, 11-6, 11-8), before Sharath Kamal Achanta, accounted for Frenchman, Simon Gauzy, the no.7 seed and runner up one year ago (6-11, 11-7, 11-7, 11-8, 7-11, 11-4). 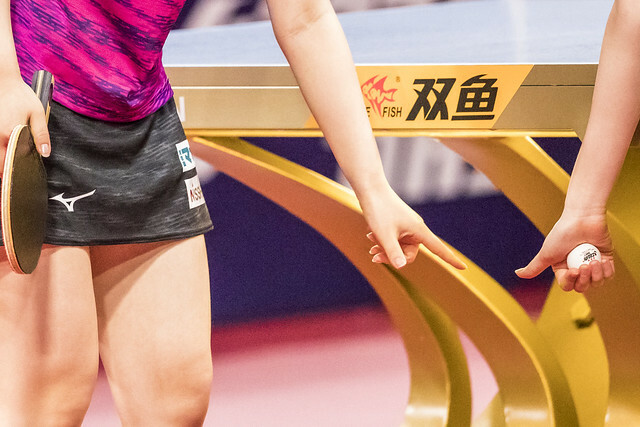 Meanwhile, showing no charity whatsoever, teenager Lin Yun-Ju overcame host nation’s David Powell, the no.16 seed (11-1, 11-3, 11-6, 11-1) to be followed by Yuki Hirano who prevailed in an all Japanese duel. Eventually, he beat Kenta Matsudaira, the no.9 seed, by the very narrowest of decisions (12-14, 12-10, 11-9, 9-11, 3-11, 11-8, 12-10). Four upsets making a first round Men’s Singles ten in total. Furthermore, one more seed almost departed; Japan’s Tomokazu Harimoto, the no.5 seed, saved two match points in the sixth game against Chinese Taipei’s Chen Chien-An, before trailing 5-9 in the seventh and then winning six points in a row steal victory (9-11, 9-11, 11-7, 11-6, 11-13, 12-10, 11-9). Surprises abundant, not for China’s Xu Xin, Germany’s Patrick Franziska and Japan’s Jin Ueda; they emerged successful as their status predicted. Xu Xin, the no.2 seed, withstood a brave challenge from Taimo Arinobu, like Jin Ueda from Japan (11-8, 10-12, 11-8, 9-11, 11-7, 11-6); rather more comfortably Patrick Franziska, the no.14 seed, beat Korea Republic’s Kim Donghyun (11-6, 11-9, 8-11, 11-4, 11-2). Similarly, Jin Ueda, the no.13 seed, ended the hopes of colleague Masataka Morizono (13-11, 11-9, 11-9, 11-3). The second round of the Men’s Singles event will be played later in the day in the evening session of play.